Leader in Vulnerability Management Technology Selected in exclusive List of Innovative and Cutting-edge IT Vendors. NopSec, a Precision Threat Prediction and Remediation company, announced today that CRN®, a brand of The Channel Company, has named NopSec to its 2016 list of Emerging Security Vendors. This annual list recognizes recently founded, up-and-coming technology suppliers who are shaping the future of the IT channel through unique technological innovations. In addition to celebrating these standout companies, the Emerging Vendors list also serves as a valuable resource for solution providers looking to expand their portfolios with cutting-edge technology. For the fifth consecutive year, NopSec has been selected to CRN’s Emerging Security Vendors List due to the company’s exceptional contributions and superior thought leadership in vulnerability risk management technology and information security. The recently released NopSec Cloud Security Module is a first in cloud security - an innovative cloud vulnerability management engine, integrated within the NopSec Unified VRM platform, that leverages OVAL compliance and a patented risk prioritization engine. The Cloud Security module empowers IT teams managing cloud infrastructures to accelerate risk prioritization and threat remediation. NopSec’s thought leadership initiatives include their Annual State of Vulnerability Risk Management Report, referenced by top IT professionals for its findings on key security threats by industry, and NopSec’s ground-breaking use of social media threat intelligence correlating to information security vulnerabilities. 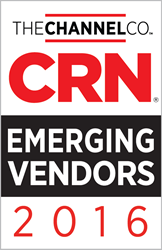 The Emerging Vendors list will be featured in the August 2016 issue of CRN and online at http://www.crn.com/emergingvendors.